When I let The Girls out yesterday morning the sky was just turning grey, the birds were singing, and it was clear that something out of the ordinary was happening. The night before had been spent getting hunting gear out, so the early hour signaled something good ahead. By the time the kennels were loaded up both of them were in full pre-hunt frenzy. Everything was ready, so we climbed aboard and headed east. East??? Our destination was Menomonie, Wisconsin. 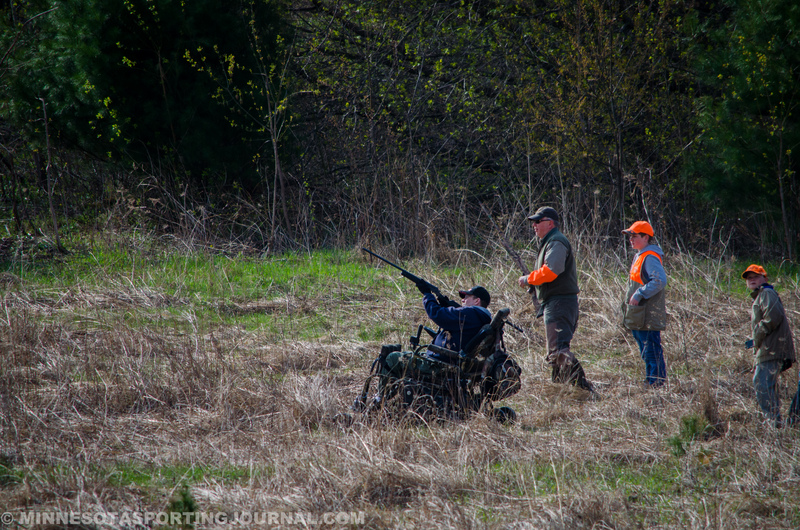 More specifically, Whispering Emerald Ridge to take part in a special event for hunters with disabilities. The Washington County Pheasants Forever chapter has participated for several years and this year offered a chance for me to check it out. I am so glad I did! My main job for the day was to take pictures and to recap some stories of the day. I’m going to apologize right now for not getting everyone’s name and all the details written down. I was having so much fun taking in all the action, I forgot to take down names and notes. I had an absolute blast with all of you and look forward to living out more stories with you ahead! 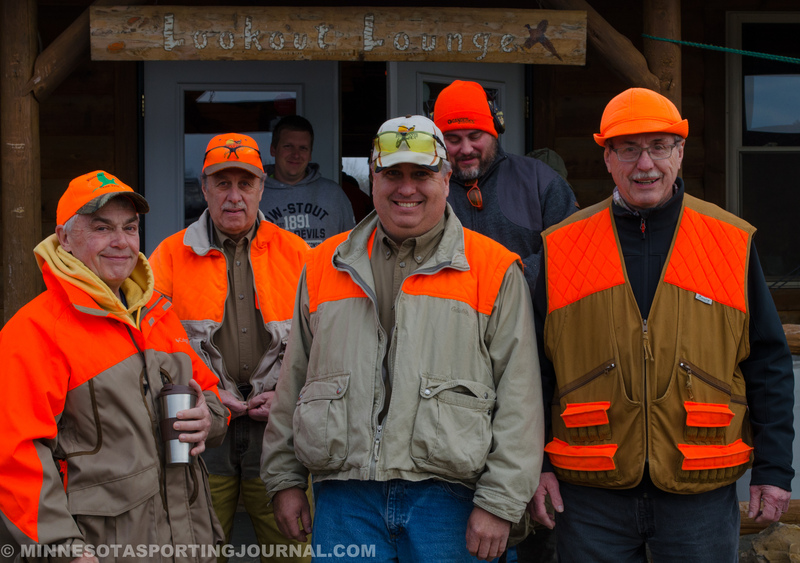 The day started out like any other pheasant hunt: Men and women in orange hats and vests laughing and telling stories. Some may have even been true, but that can’t be confirmed at this point. The coffee was flowing when Bruce Olson, the owner, called the day to order. Groups were formed and the wave of orange clad people began moving towards the equipment. That’s when I realized that some of these guys wearing orange were also in wheel chairs. 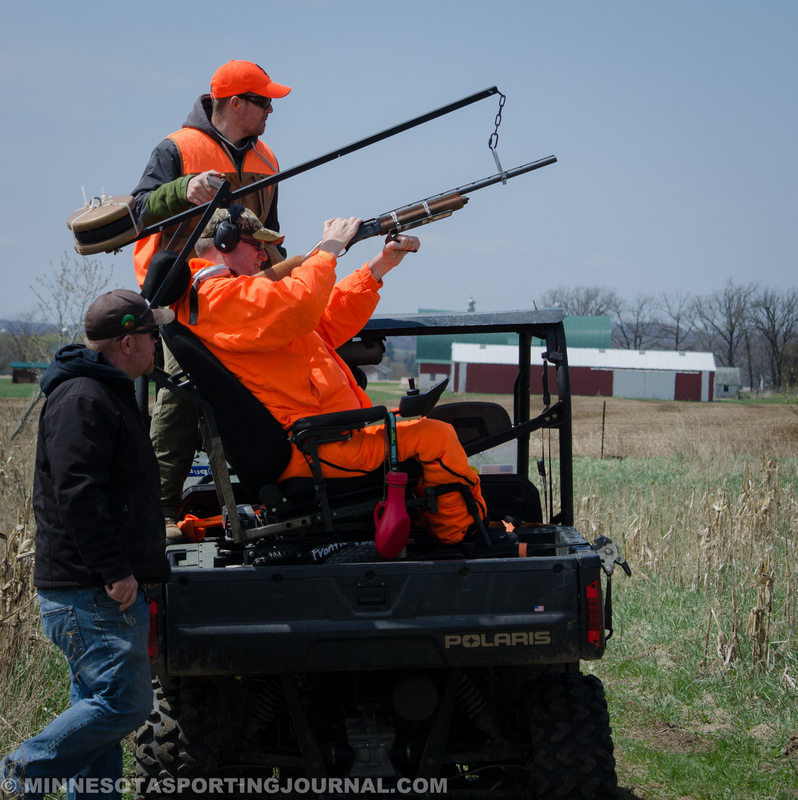 You can imagine that hunting pheasants isn’t what most engineers had in mind when designing a wheel chair. 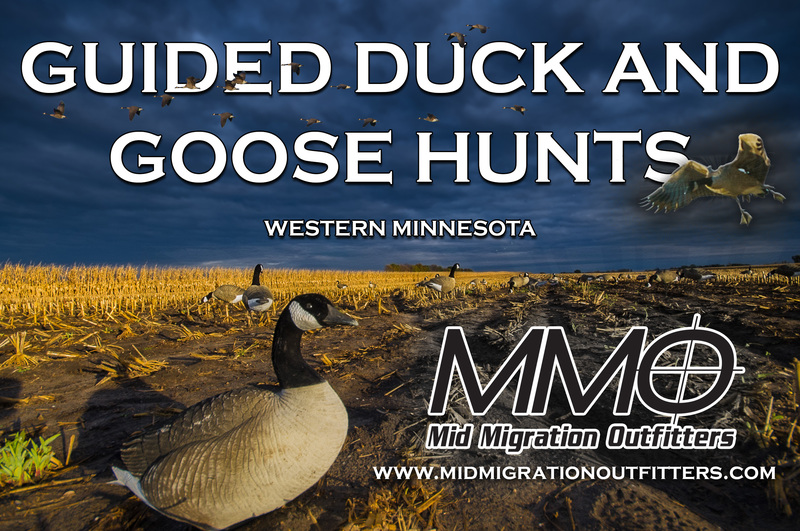 Corn fields, fence rows, and swamps demand a few different accessories than you might need at, say, the Mall of America. With this in mind, a couple other modes of transportation were employed to make sure hunters could get safely to the birds. An Action TrackChair was brought in to provide all terrain mobility. This great invention gives the hunter the ability to get where he wants to go. 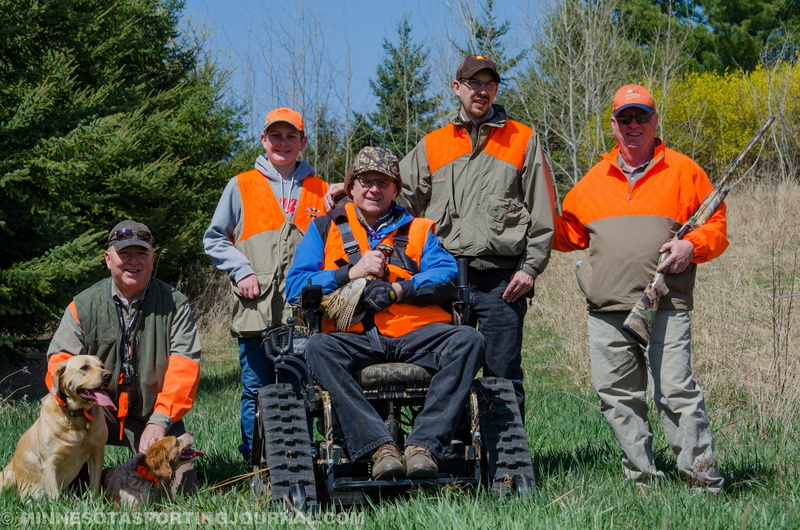 Large tracks, joy stick controls, fully adjustable seat, and other state of the art technology mean a safe, comfortable hunt is possible for everyone. Side-by-side four wheelers were also used. 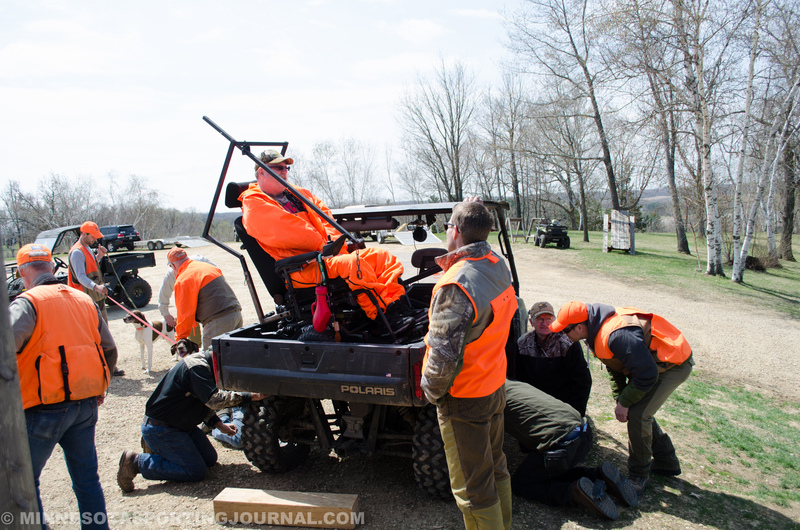 Hunters and their chairs were secured into the cargo box so they would be positioned for clear shooting once the birds were located. The stories and laughter continued throughout this process and the anticipation was building. The plan was use pointing dogs to find where the roosters were hiding. Once found, the hunters and their entourage would move into position. 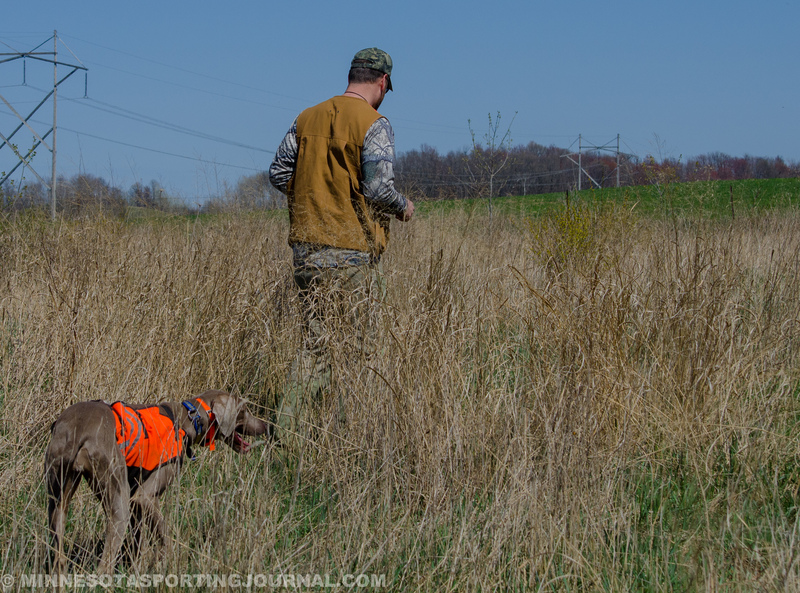 With safety as a primary concern for all, each hunting party had a driver, gun bearer, dog handler, and often an extra person to cover any additional tasks. For the morning session, I followed two groups to Field 1 and caught up to them as the birds were being set out. 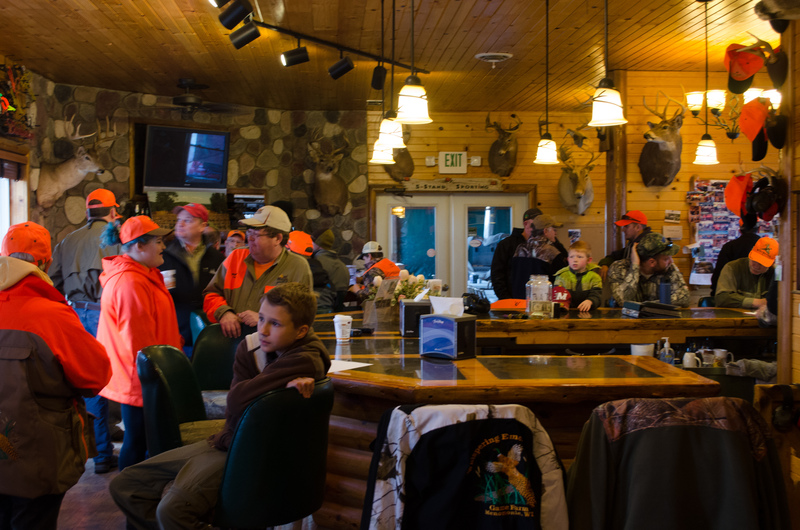 It felt like Opening Day: Clustered together, watching the clock tick towards hunting season, and sharing more stories of past hunting adventures. Finally, it was time! 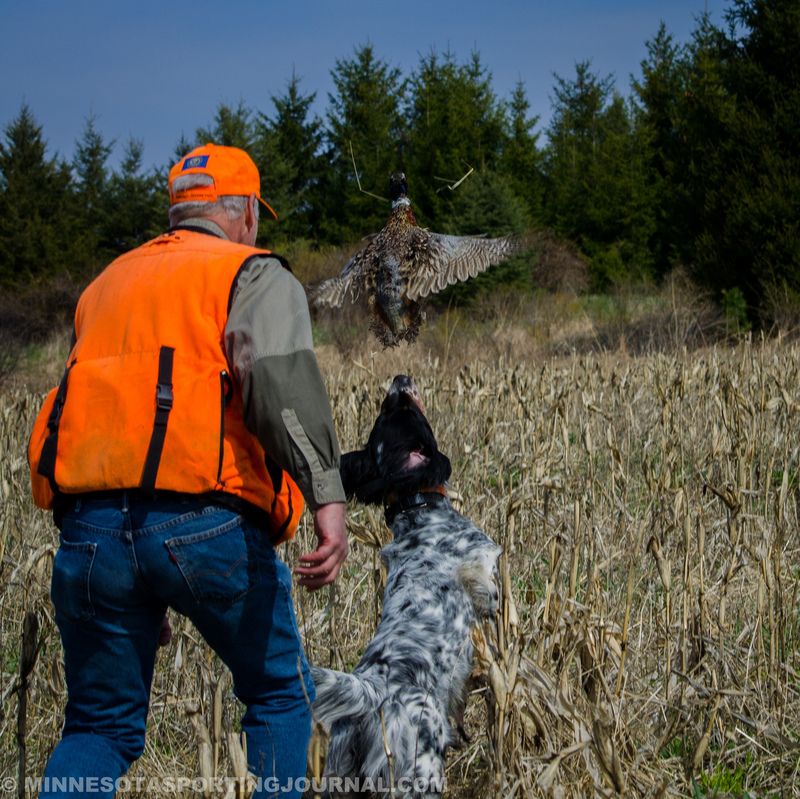 The important combo of our group was George, the hunter, and an English Setter named Jim. They proved to be a powerful duo when Jim locked up on the first rooster. George was quickly moved into position, his gun was loaded and handed over, and the bird was flushed. The view through my camera lens showed a blurry streak making a break for the next county as a shot rang out. I was thinking of some kind words for George as I continued to snap pictures of the fleeing ringneck. Just as that rooster reached the Dunn County line George fired again. My camera showed the bird folding up and dropping to the ground where Jim proudly pounced on it. It was a shot that should give George some serious bragging rights! 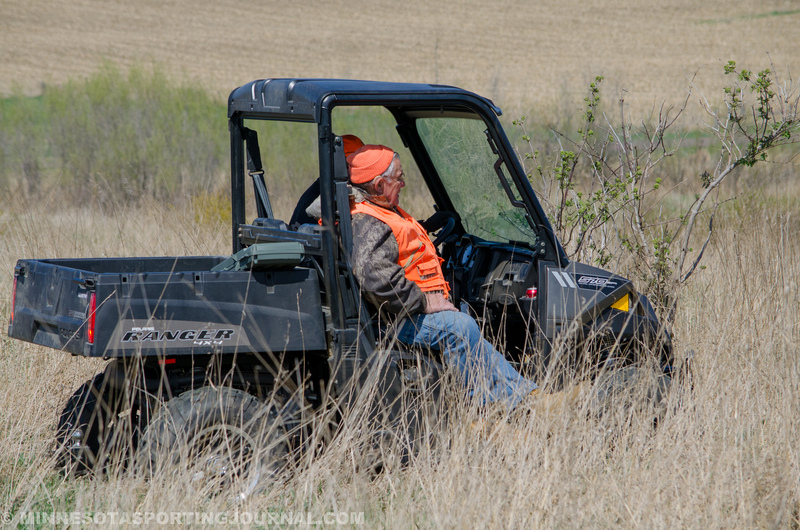 A glance toward the opposite end of the field and the hunting group there, showed that Dave was making good use of the Action TrackChair. It looked like he was having no trouble navigating the terrain and cover of this field. 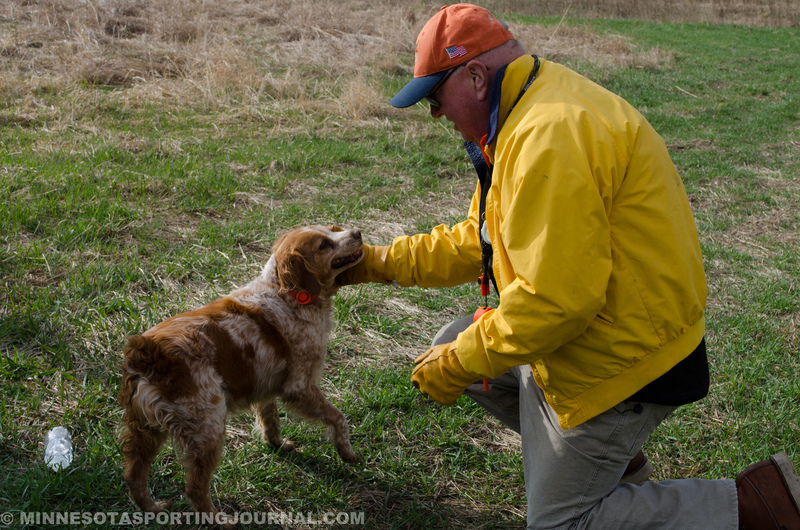 He was hunting over Annie, an exuberant Brittany Spaniel determined to discover where the roosters had hidden. 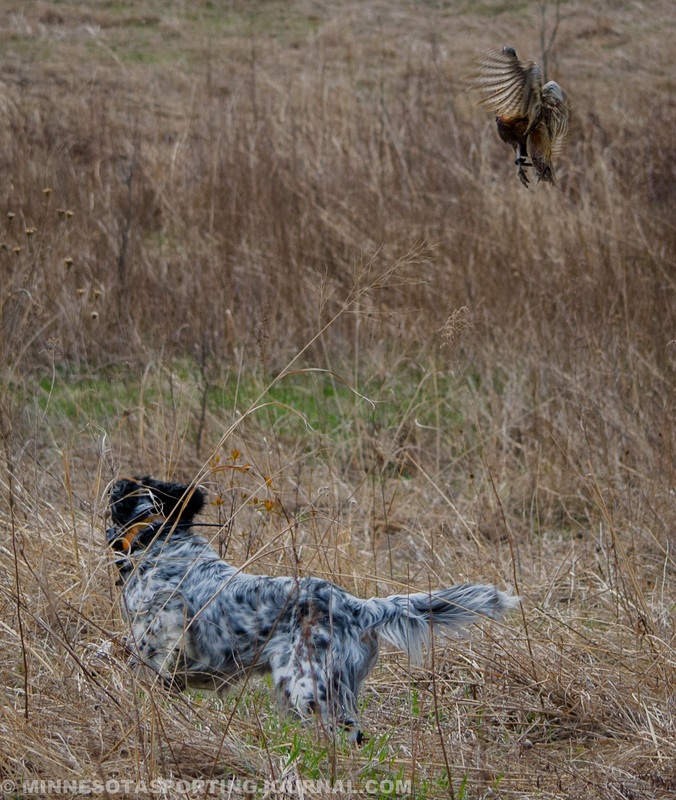 As I watched, Annie marked a rooster that decided to make his exit by buzzing over the hunting party about head-high. Dave could have shot that one in self defense, but people would have been scrambling to avoid the falling bird. His good nature won out as he let it fly over to George’s side of the field. As the morning wrapped up we gathered in the clubhouse for lunch. Hunters and volunteers ate way too much of the wonderful meal that was laid out for us. A meal that good would normally keep conversation to a minimum, but it was clear that there were stories ready for the telling. As I looked around the room I it was clear that everyone was having a good time. 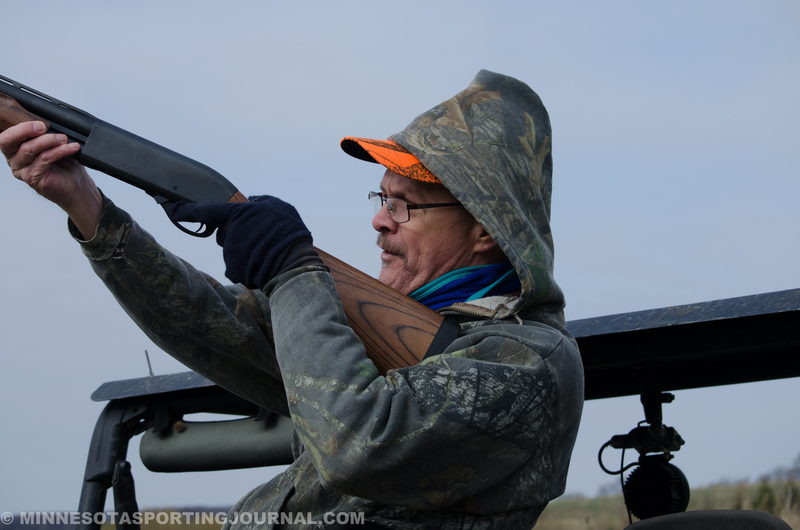 I tagged along with Pete Hestekin, Jim’s owner, for the next hunt. A plan was laid, birds were set, and the hunt was on once again! The birds on this field apparently had another plan worked out. 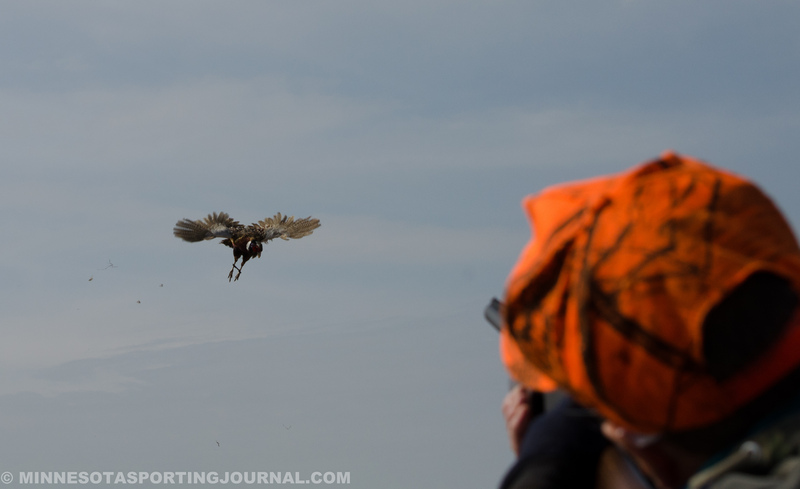 They did not cooperate at all, but once again, I left the field impressed by my fellow hunters. Every time I hunt with someone new, I find myself keeping one eye on them to make sure all the basic safety rules are followed. Just like the morning hunt, safe practices were the rule. Shots were passed up when birds stayed near the dogs. No ground shots were taken. Guns were always kept safely under control. This session ended with no birds shot, but we enjoyed our time together celebrating good dogs, roosters, and sunny days. I believe this hunt happens for a number of reasons. 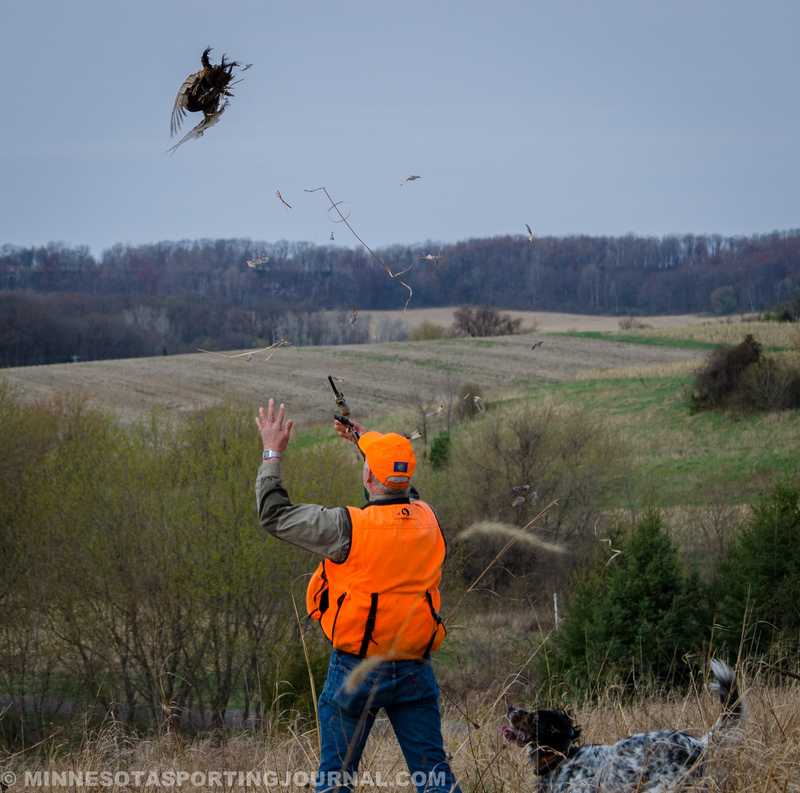 Sportsmen love the outdoors and love sharing it. We want to make sure that our brothers and sisters all have the chance to take part in it. That means we spend time and money on conservation and habitat so our kids and grand kids will get their chances. 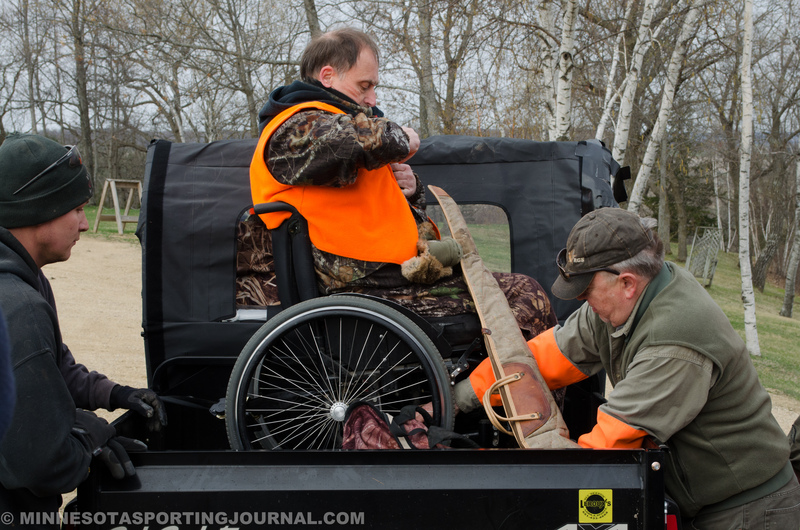 That means we come together on a Saturday morning to overcome the barriers preventing our hunting partners with limited mobility from spending a day afield. 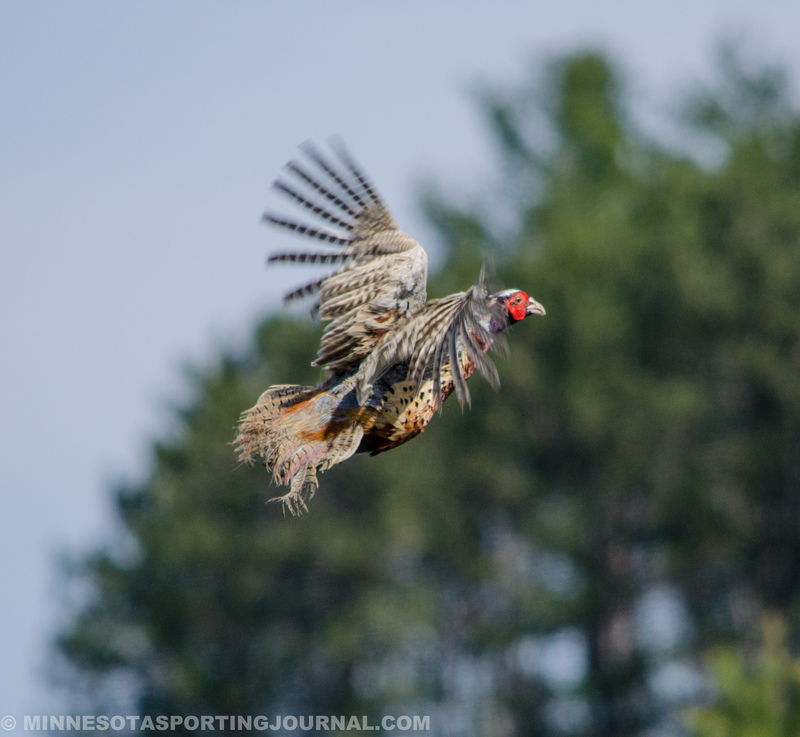 That means we support organizations like Pheasants Forever and Capable Partners. Together we can do those hard things that seem so impossible when we are alone. And we’ll get to tell some stories and have some laughs along the way. Next MNSJ Podcast: Gary Roach and Al Baert.